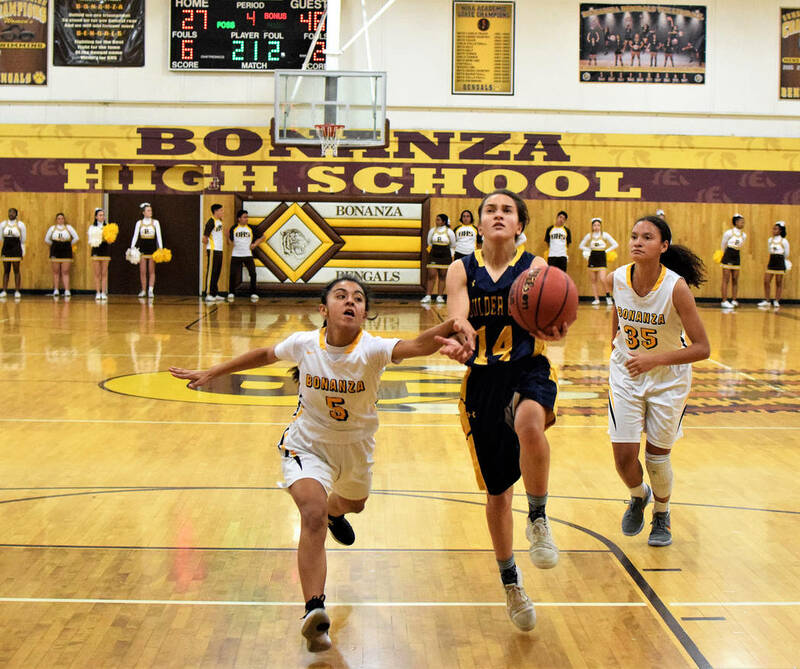 The Boulder City High School girls basketball team picked up a road victory Monday, Dec. 3, defeating 4A Bonanza 57-38. (Robert Vendettoli/Boulder City Review) Boulder City High School junior quarterback Makaela Perkins scrambles up field against Southeast Career Techical Academy on Nov. 28, 2018. She completed 17 of 33 passes for 164 yards and two touchdowns. (Robert Vendettoli/Boulder City Review) Boulder City High School junior guard Keely Alexander goes up for a layup against Bonanza on Monday, Dec. 3, 2018. The Lady Eagles won 57-38. Coming off a heartbreaking 41-38 Lake Mead Holiday Classic championship loss to rival Moapa Valley on Saturday, Dec. 1, the Lady Eagles rebounded against the Bengals with a solid defensive effort. Juniors guards Madison Manns and Keely Alexander scored in double figures to lead the Lady Eagles. Efficiently working their way inside, Manns scored a game-high 17 points, while Alexander scored 14 points. Senior Hannah Estes added 9 points, sophomore Alyssa Monroe added 8 points and junior Ellie Howard scored 7 points. Making the All-Tournament team at the holiday classic, Manns led Boulder City to victories over American Prep 50-19 and Lincoln County 54-40. The Lady Eagles will host 4A Foothill on Friday, Dec. 7, followed by a home game against SLAM Academy on Monday, Dec. 10 and a game at Green Valley on Wednesday, Dec. 12. 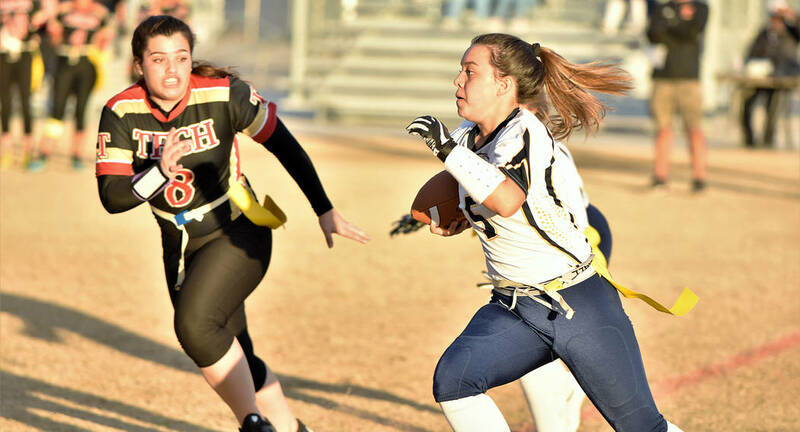 The Boulder City High School flag football team picked up its first victory of the season Monday, Dec. 3, defeating Western 25-6. Rebounding from a 14-0 loss to 4A Tech on Nov. 28, the Lady Eagles’ offense was clicking against the Warriors on Monday behind junior quarterback Makaela Perkins. Playing much better in her second outing of the season, Perkins completed 17 of 33, passing for 164 yards and two touchdowns. Perkins found seniors Ryann Reese and Haley Jackson for touchdowns. Reese finished with four catches for 47 yards while rushing for 87 yards and a touchdown on six carries. Jackson finished with three catches for 57 yards. Relying on experience to get them through league play, the Lady Eagles also had a pair of newcomers contribute offensively. Junior Makena Arboreen caught three passes for 25 yards while rushing for 20 yards on four carries. Junior Jasmyn Curl added 43 rushing yards on five carries. Leading the defense, Reese tallied six tackles and an interception, while juniors Emily Rinella and Clarissa Sitko each added six tackles. The Lady Eagles will travel to Valley on Friday, Dec. 7, before hosting Sunrise Mountain on Monday, Dec. 10. Boulder City High School’s boys bowling team remained undefeated Tuesday, Dec. 4, winning the match against Somerset-Losee 1,698-1,500, bringing its season record to a perfect 5-0. Three bowlers broke 400: sophomore Jamison Kaboli (466), freshman William Wallace (458) and senior Samuel Holt (400). Sophomore Spencer Torgesen bowled a 366. The Lady Eagles fell to Losee 1,337-1,012, leaving them 2-3 for the season. Senior Samantha Wagner led the way with a score of 311, while freshman Valerie Chavez and junior Kali Martin bowled a 264 and 253, respectively. The Eagles will host Valley today, Dec. 6, followed by road matches Friday, Dec. 7, against Western at Texas Station and Sunrise Mountain at Sam’s Town on Wednesday, Dec. 12.